Soccer fans are already booking plane tickets for the 2014 World Cup held in Brazil next summer. After they leave, another wave of visitors will descend on the country during the Olympic Games held in Rio de Janeiro in 2016. Travel tied to the sporting events will only add to the already busy skies over Brazil. The number of passengers has doubled since 2007 and is expected to grow at a more than 6 percent clip over the next decade. With airports in Brazil’s largest cites Sao Paulo and Rio already near maximum capacity, the country needs to act quickly. Over the last two years, large Brazilian airlines like GOL, the nation’s navigation service provider DECEA, other key players have been working with GE Aviation to find a solution and use big data to crack the problem. With the company’s help, they have started rolling out GE’s Required Navigation Performance system (RNP) at 10 key airports in southeast Brazil, including the capital Brasilia. 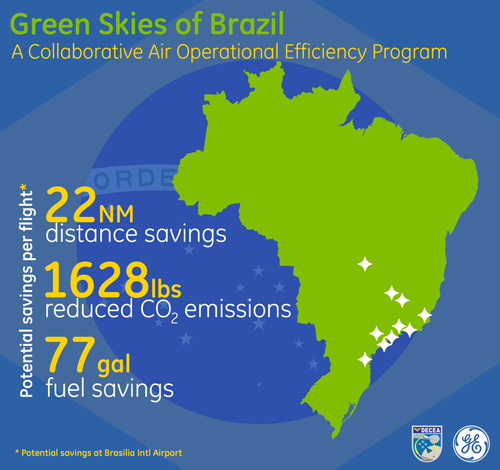 RNP is part of GE’s ecomagination portfolio and GOL estimates that at the Brasilia airport alone the airline could potentially save 22 miles and 7.5 minutes per landing approach compared to the conventional paths. It could also reduce carbon dioxide emissions by more than 1,620 pounds and bring $24 million in operational savings over five years. RNP relies on GPS signals rather than ground-based radio beacons. It is an example how airlines and airports can tap the power of data to improve operations. The 10 airports selected for the program will be: Guarulhos, Congonhas, Viracopos, Galeão, Curitiba, Brasília, Confins, Vitoria and Pampulha; initial paths at Santos Dumont were deployed in 2012. RNP is just one big data tool in GE’s portfolio to improve airline and airport efficiency. Systems developed by Taleris, GE Aviation’s joint venture with Accenture, tap the Industrial Internet and use sophisticated software to harvest and analyze gigabytes of data generated by hundreds of sensors working inside airplanes. The tools allow airline like UAE’s Etihad to monitor planes in real time, reduce fuel costs, manage plane maintenance, and even spot problems before they happen. Read about GE's Big Data Tech on GE Reports.